Everybody who’s used a gas grill has inevitably run out of propane. Murphy’s Law usually states that this is most likely to happen when you have guests over for burgers, but I digress. When you go to get your tank re-filled, it’s all the same, right? Many places, including Lowes and Home Depot, will do a propane tank exchange. Sounds pretty simple. You take your old tank, drop it off, grab one that’s been filled, head over to the cash register, pay the $20, and head back all before the grill gets cold. Technically that does work, but I wouldn’t recommend it. Because you’re getting ripped off. OK, well maybe not ripped off (though that does sound beter), but you are definitely overpaying. Most tanks that attach to grills are able to easily hold 20 pounds of fuel. Back when propane exchanges became common they filled it up to 20 pounds. All worked out well until they decided to raise the price. But did they raise the price on what you pay. Nope. Instead, they employed my least favorite strategy ever: they started giving you less. That’s right. Most ‘exchanges’ will now give you a tank that’s been filled…with 15 pounds of propane. That means you’re effectively paying 33% more. That means you’ll be making a return trip much sooner. That means someone’s bottom line is getting bigger (and it’s not yours). Take your tank somewhere where they re-fill it. They will likely charge the exact same price, and they’ll fill it all the way. Google ‘propane refill’ and your zip code and you should easily find a place. Bonus tip: Once you find a place, see if they have a website. The place I use had a $2 off printable coupon, which makes it even more of a deal! Bonus tip #2: Always make sure you have proper home insurance. 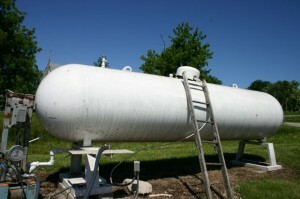 Propane leaks and such are rare but it’s better safe than sorry! When grilling with gas, make sure you get what you pay for. Twenty pounds of gas and not an ounce less! Good post, MB. I've been thinking about a new propane grill, now that I've had the experience of grilling on one during 4th of July. Makes me a little mad to hear about this sleight-of-hand. Fortunately I have a propane refill place close by at work. Money Beagle, you are the king of spotting smaller packaging. We've used Lowe's exchange for our last 2 refills and now I feel stupid. I never thought about the tanks not being full! @First Gen – I always let my tank bleed dry, so never a problem worry about a partially filled tank. I had no idea the tanks were not completely full at the exchange locations. Over the course of a year I can see how this cost could add up…we really like to grill a lot. I've never heard of this.. crazy. Those exchange places never really made sense to me but I'm not the one in charge of it so I stay out of it. I'll let my hubby know. Great tip…something I never even thought of.